Each year on 8 March, Zonta recognizes International Women's Day and Zonta Rose Day. As a way to recognize extraordinary women, the day serves as an opportunity to reflect on past success and call for future action. Through the Zonta International Foundation, members are able to honor special people in their lives by making a tribute donation to the Foundation's Rose Fund. Consider making a donation to our local organization to celebrate a woman who's made an impact in your life. Join us for our monthly membership meeting held the 1st Thursday of each month from 4-6pm (unless otherwise noted). Interested in joining us? Email member@zontahhi.org to register as a guest. Join the campaign to end violence against women by walking a mile down Coligny Beach to raise awareness and bring hope to those in need of healing. This event is FREE and open to the public but we encourage you to REGISTER HERE for the event. Interested in joining our meeting as a guest? Email member@zontahhi.org. ON THURSDAY, MARCH 15, 2018, the Zonta Club of Hilton Head will host our spring fundraising event at the Shipyard Plantation Beach Club on Hilton Head Island. Join us for an evening of wine and beer tasting, hors d’oeuvres, Silent and Chance auctions while listening to the sounds of the ocean at one of Hilton Head's premier beach resorts. Join us for a fun and exciting evening to raise funds for local organizations such as Hopeful Horizons (formerly CODA and Hope Haven); educational scholarships for young women in the Hilton Head area; representation of our club in state and national programming; and our on-going local and international campaigns that bring awareness to eliminate violence against women and hope to survivors of sexual assault and domestic violence. 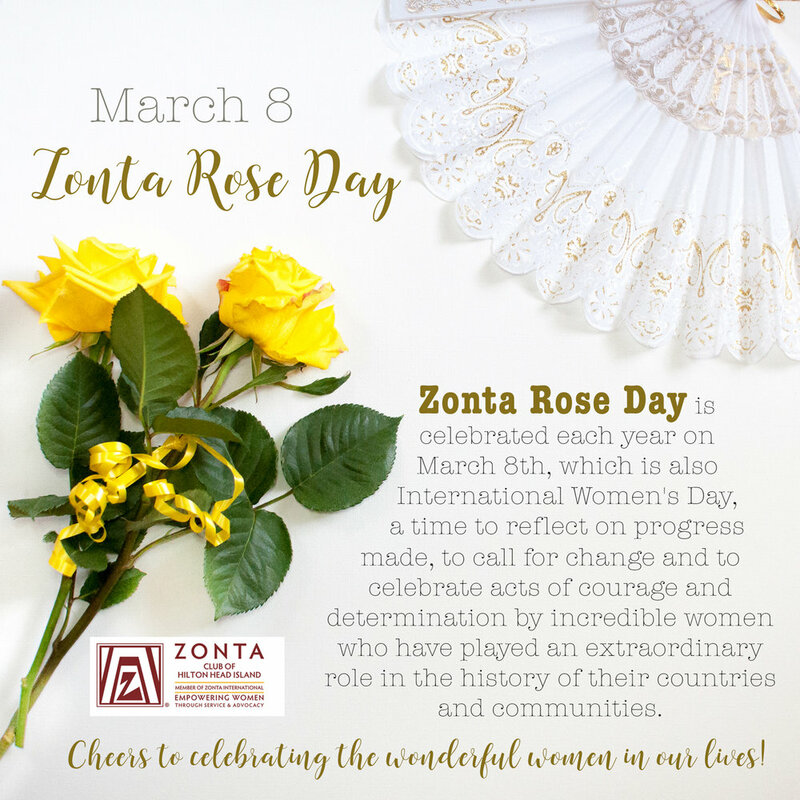 In honor of International Women's Day each year on 8 March, the Zonta International Foundation celebrates Rose Day. To show your appreciation to the women you admire, who will stand beside you in your endeavors, make a donation to the Zonta Club of Hilton Head in their honor. Your donation to the Zonta Club of Hilton Head enables Zonta to continue supporting projects and programs that help women achieve a life free of violence and empower them to overcome gender barriers that hinder their access to health, education, and professional resources. *UPDATE:* Tickets are NOW available! Limited and going FAST! Tickets are $30/rider (or you can give BIG for $50!) and SPACE IS LIMITED. Click HERE for tickets! Not available to join us in the ride? Contact us to make your donation and be there with us in spirit! **PLEASE NOTE: THIS MEETING HAS BEEN CANCELLED DUE TO INCLEMENT WEATHER. WE WILL RESUME WITH REGULARLY SCHEDULED MEETINGS IN FEB 2018. Join us for our monthly membership meeting at the Indigo Run Club from 4:00 PM - 6:00 PM. The Zonta Club of Hilton Head's monthly membership meetings are the 1st Thursday of each month unless otherwise noted. Please email member@zontahhi.org to register and for more information.